Without stealing their thunder, here are some of the more interesting aspects of the paper. I should note that EHT (Extended Heim Theory) is a nod to the original HT theory of Burkhard Heim, but is not dependent upon his math (which has been known for some time to include errors). It is a framework which still includes several speculative assumptions. Until EHT is further developed (a Part III is planned) I look forward to the responses to this innovative framework that goes against the grain of a predominant school of physics beyond the standard model. One of the major tenets of the framework is the idea that an extra number system can successfully substitute for the idea of extra dimensions posed by string theory, superstring theory and the more general M-theory, which has dominated physics for decades. String theory is thought to predict the grand unification of gravity with particle forces, but EHT predicts that supersymmetric partners do not exist and gravity can not successfully be described in a theory of quantum gravity at the Planck scale (see Principle of duality). Part II posits certain fundamental principles that help guide our thinking about the cosmos. 1. Principle of duality. This includes that geometry and energy are interdependent entities. They exist as two sides of the same coin. This requires that the spacetime lattice and dark energy to be generated simultaneously and independently. The energy of information and organization (part of the spacetime lattice) are separate but related to the energy of mass (mass being derived from dark energy). 2. Principle of extra systems of numbers. The rationale for the extra higher space dimensions of superstring theory and its superset M-Theory can be satisfied by extra number systems, such as the hypercomplex quaternion and octonion numbers. Mathematician Cohl Furey has shown that quaternions can represent the charge of quarks and leptons in the standard model. See: https://www.youtube.com/watch?v=m64_DCQmzF8&index=11&list=PLNxhIPHaOTRZMO1VjJcs7_3dgyJ2qU1yZ EHT predicts additional particles not currently part of the standard model. 3. Principle of optimization. Meaning that Nature is perfectly optimized. This leads to the assumption that the total energy of the Universe was, is and will be zero and leads to the evolution of the cosmos with dark energy and the spacetime lattice generated simultaneously and in balance. 4. Principle of quantization. There are no continuous physical quantities, only discrete quantities. Therefore no infinities or singularities. For example, no worm holes. 5. Principle of dual energies. Information possesses energy and the energy to create a single bit is the same to destroy that bit. Other principles are included for quantum fluctuations, finite existence time, causality, energy conservation, dual Universe, self-interaction and organization. In addition, a series of “No-Go Theorems” are formulated that describe constraints on the limits of the physical features of the Universe. For example, no Big Bang, no Open Universe, etc. The principle of extra systems of numbers means that without the need for extra dimensions there is no basis to speculate on multiple universes (aka the multiverse) and no allowing for the infinities found in “worm holes”. Extra spatial dimensions were devised, in part, to resolve the “hierarchy problem”, which has also been interpreted as a basis for the “holographic effect” (see work by Erik Verlinde). 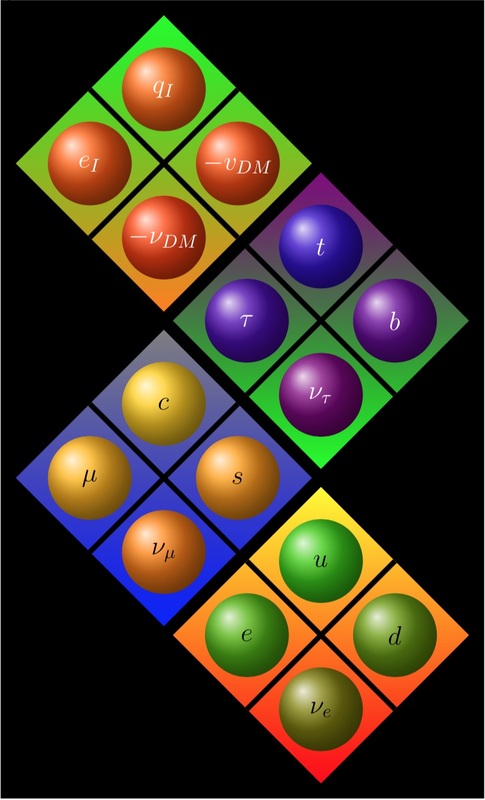 EHT predicts hypercomplex-gravity fields (extreme gravitomagnetic fields), making possible the generation of gravity-like fields independent of the gravitation of cosmology. The complex number system employed gives rise to additional gravitational particles, gravitomagnetic (attractive and repulsive forces) and quintessence (repulsive force). The extreme gravitomagnetic fields, group SU(2), are mediated by three gravity bosons that are like other mediator bosons from particle physics, and thus are completely different from the Einstein cosmological gravity fields. Each particle is millions of times weaker than normal gravity, but because of an interaction with electromagnetic force, it may result in the generation of gravity-like fields orders of magnitude greater than Newtonian gravity. This would allow for a type of controlled gravitational propulsion and design of gravitational products. The paper also discusses the balance between two types of dark energy, one attractive to matter and repulsive for spacetime, and the other repulsive to matter and attractive to spacetime. Inside galaxies there is a “gravitational polarization” due to the presence of matter and these cancel out, but not in intergalactic space. Their interaction also gives rise to the magnitude of the MOND acceleration but without the explanation given by the originators of MOND. Each type of dark energy has their own corresponding cosmological constant and in a universe without matter the combined constant should be zero. In our era the value is positive, leading to expansion, but in a future era it should lead to contraction of the universe. The speed of light, c, and time, t, requires an extension of Einstein’s spacetime when descriptive maths go from real to complex number systems. Each of these new gravitational particles is associated with its own unique speed of light. This was established in their seminal 2004 paper which forecast the possibility of traveling in a dual spacetime at many multiples of the speed of light. The concept of the Big Bang is also replaced by the Quantized Bang through a process more closely resembling a “fizz” rather than a “bang”. Not specifically mentioned in the paper, but still a part of EHT is that dark energy must increase over time. See Risaliti and Lusso for a similar view of dark energy increasing over time. The expansion of the Universe requires the generation of additional atoms of space, and since the potential energy of the spacetime lattice transforms into dark energy, and dark energy is a precursor of matter, it must also increase. As it does, the potential energy of the spacetime grid decreases.